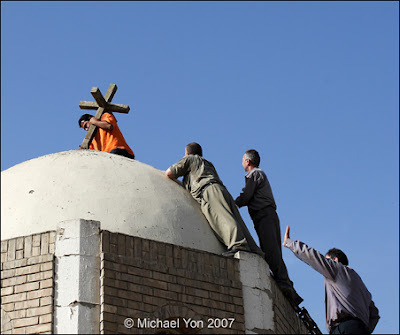 Michael Yon reports from Baghdad a Catholic church has re-opened. Let’s hope these sentiments continue to spread. Let’s put it together–Catholic Church, Baghdad, Christian and Muslim working together, Thanks, Freedom bells—what part of good news is it that makes the left so sick? Let’s hope we see many more stories such as this. While you’re at it, help Michael out so he can continue bringing us his good news–the news the MSM doesn’t want you to know and the news that’s the death knell for the defeatists. You can donate to him here. Thank you Michael, and thanks to the men and women who worked together to re-open this church.